Sorry, this post won’t have many photos until I get to a better Internet. Africa is amazing that it doesn’t have very strong internet for uploading. 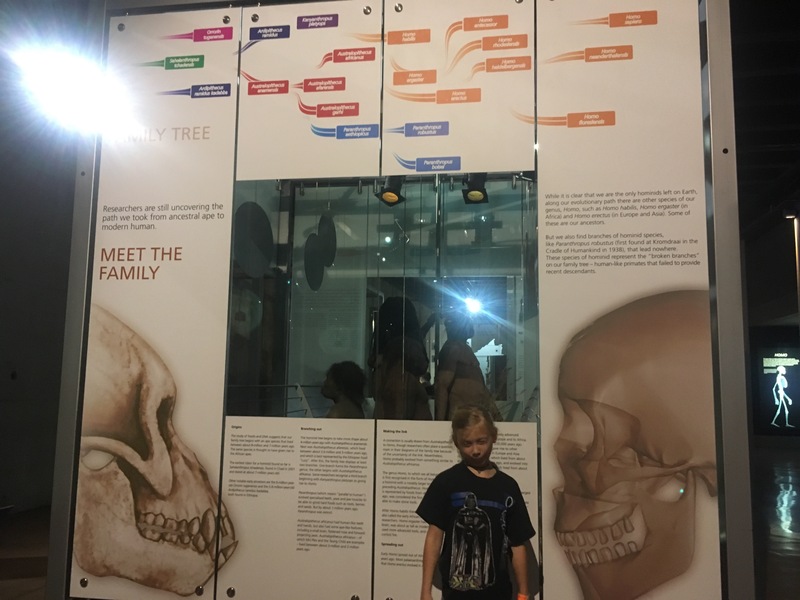 I got to see lots of skulls and bones from humans that were still part monkey. There are 5 big spots in Africa where scientist find bones that are part human but also part monkey. The bones become more and more humerus like and less monkeys like. That is called evolution! And that is why they call these spots in Africa the Cradel of Humanity and why Africa is called the Motherland. 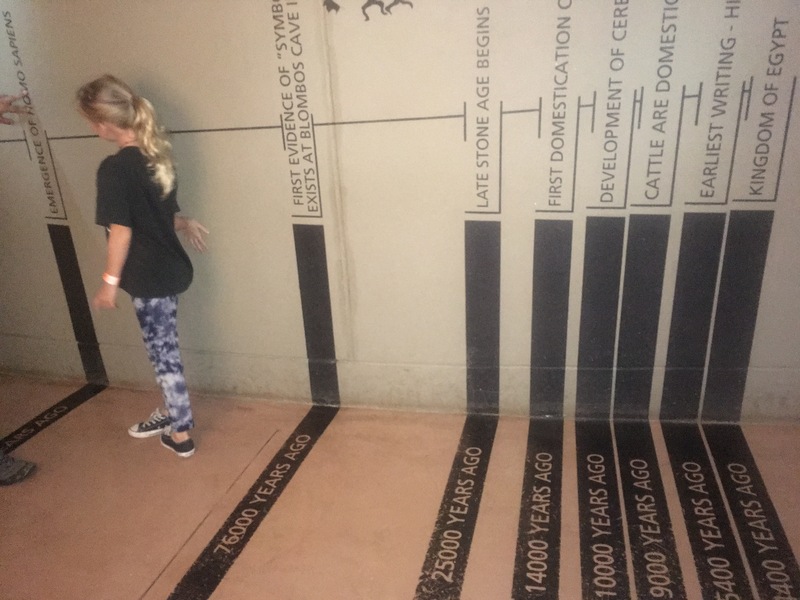 To see these bones and learn about the evolution of humans from monkeys, we first went to a museum then we went to one of the caves were hundreds of the bones were found. The museum was for kids. It had a ride that was ….. soooo cool. It even had a ride that showed you how the the Earth began 70 billon years ago and hiw life on earth started. Let’s get to the fun stuff, the ride. The ride was a long river inside a tunnel where you rode in a boat through the different time periods. It even had real ice in the cave to show the Ice Age. It was just so cool and you were all alone in there, so it felt so real. In this part of Africa there are hundreds of caves formed billions of years ago. 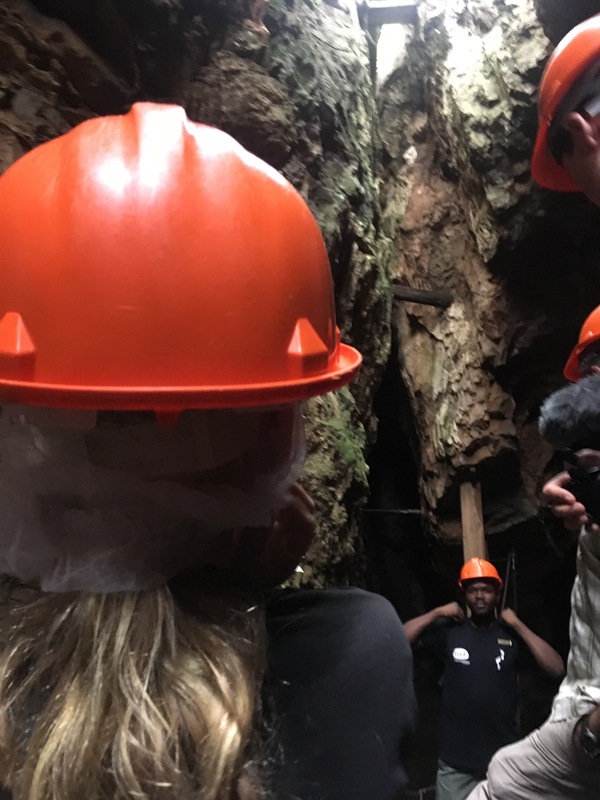 The cave we went to is called Sterkfontein Caves. When we were in the cave we had to were hard hats and stick togather or we might get lost because the cave is really big with lots of passage ways. So let’s think about this, how did theses caves get all these cool bones? 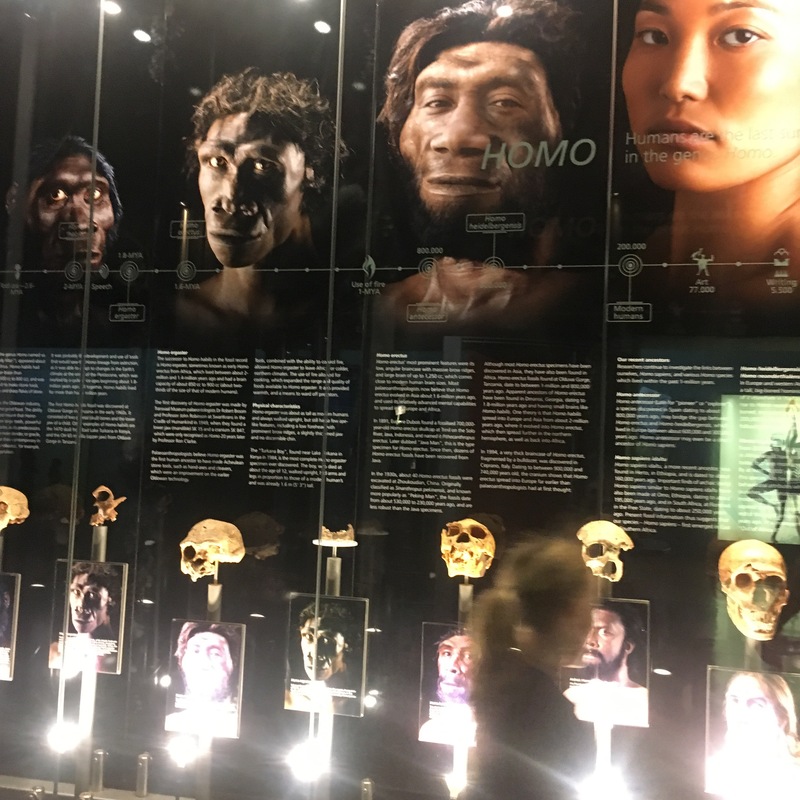 Imagine you are one of these early humans 2.7 – 2.5 million years ago and you are just walking along not seeing the hole in front of you when all of a sudden you fall through and drop down into the cave where you die. Or you die above ground but your bones get washed into the cave by rain or floods. Why is this Important, you ask? Nothing shows scientists that they lived in the caves. Only that they lived above ground. Next up, the safari! We spent a day at the Pilansberg National Park. It was a volcano that caved in to form a crater and now is home to the big animals! It was so cool to drive around all day looking for wildlife. Right when we got in the the park the first thing I saw was an elephant and a lot too. They took down trees to eat and just walked down the road in front of our jeep. I never thought I would be in an elephant traffic jam! We saw hippos, rhinos, zebras, leopards, birds, a giraffe and a lion!!! 4 out of the big five, cool right? Well, I have to go hang out with some monkeys. More on that in my next post. Got it!!! Thank you Uncle Bill!! hi cricket! 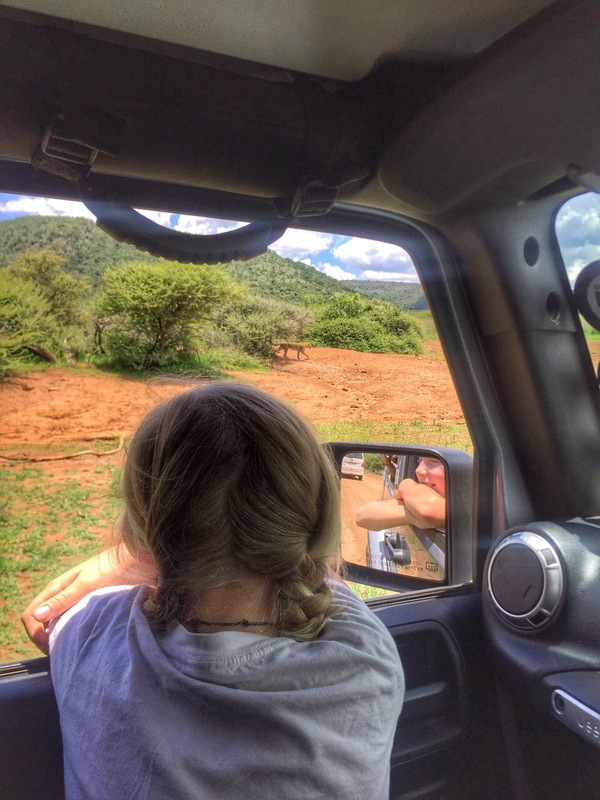 your time in africa so far looks truly amazing! i am so proud of you and your mom for taking this trip and for getting the most out of your time! i think i love your africa pictures and posts the most. i may never get there in my life, so i am living vicariously through you. stella misses you a lot! keep having a wonderful time!! Wow! Thank you so much. I love Africa too! Tell Stella I cant wait to have a big sleepover with her. Love your blog. Amazing place you are visiting. Yep. Did you see I adopted a baby??? Mama C, Did you adopt a boy or girl monkey? Thank you! Monkeys are so great! Glad we were one. Cricket, I love caves. I have been in lots of them and even one in a glass bottom boat. Caves are awesome! You and mom must really like wild animals. Can you believe an elephant traffic jam? I really never thought of Africa as the cradle of humanity. See, you learn something new every day. I still enjoy your blog. Keep up the good work!